This ride was fun and surprising. I was in line with my friend and we were both kinda scared because I always get nervous before riding an indoor roller coaster because you cant see it before you ride. The wait was longer than expected, but thats not very long compared to other parks(CEDAR POINT!) It is very much worth the wait and it was one of the most fun coasters Ive ever been on! Best ride at the park! 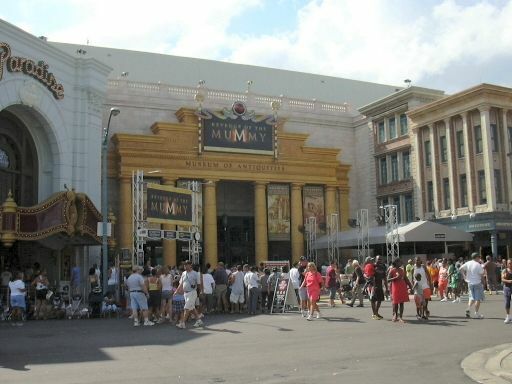 To cut to the chase, Revenge of the Mummy was a very good ride that seemed to get better every time I rode it. However, although I see a lot of 10s for this ride, I did not think it was quite that good. It is certainly a all-encompassing sensory masterpiece though, and the most thrilling ride at Universal Studios. The theming of the building itself is very good. I have not seen the sequel to The Mummy, but I did see the original, and thought it was fairly good. Truth be told, I think I prefered the ride to the movie! The ride ops, like all of them at Universal Orlando, were great. The slow movement through the darkness at the beginning of the ride was very good, as was the scarab beetle and reversing of the train effect. The main launch hill was great, bursting through the mist, darkness, and intense turns that make up the middle part of the ride. After the fake ending, the curving drop is excellent; however, almost immediately after this, the ride ended. I would have liked to have another coaster portion as long as the first, but the ride is still plenty long, and no ride is perfect in every way. Definitely a must-ride, its a great technological ride, and another great addition to Universals lineup. Awesome ride! Just what Universal Studios needed. Even though I was a fan of King Kong, this is indeed much better! Themeing, as always with Universal/IOA, is incredible. My first time on it was just amazing. Its still fun to re-ride it over and over, but nothing beat the 1st time. This is a psychological thriller with several surprises best enjoyed the first time. The ride makes use of misdirection, and does a few things the rider doesnt expect. I agree that they could have added several things to make it more thrilling. I would have given this a "9" if they had an animitronic mummy pop up over the edge of the car and breath hot steamy mummy breath on the riders. I suppose they dont want people to die of a heart attack though. The special effects were inconsistent. On my second ride, the green light in the mummys mouth didnt work, but worked again on the third ride. Also, the red steam after the fake station was inconsistent. The end was a dissapointment. If they put a couple more million dollars into this ride and gave it a more believable fake station, mummy-on-car, and a real conclusion, then this would be the best ride ever. This is one of Universals most creative attractions. The queue line is extremely well done, and if you watch the preshow movie, youll understand the story perfectly. (Even if you miss the movie, the story is your typical Universal You shouldnt be here plot) The coaster loads pretty quickly, the seats are comfortable, and the ride attendants are really hilarious. The first few scenes of the ride are nice, although I feel that the dark ride section should be a little longer. I think that Universal did a spectacular job with the amount of space that they had though. The fire effects throughout the ride are really cool, especially in the not-so-fake station, and the animatronics throughout the ride are very good as well. The dead end scarab scene and backward drop are very fun, but the highlight of the ride is the launch and the extremely intense airtime that follows. The colored mist throughout the coaster portion of the ride is also a very cool effect, as are the images that are seen as you fly through the coaster. The coaster itself isnt real intense, but when combined with the spectacular theming, this ride really succeeds on many levels. Overall, a very creative and totally unique experience, and one that is certainly not to be missed. Awesome ride, when I first went on this I had no idea what it was. I had not heard anything about it, but I saw a new ride and went on it. At first I thought it was just going to be like a jaws or earthquake kinda ride, but after we launched through the mummies mouth I saw how awesome this ride was. The theming was amazing and the whole ride felt like a movie. In my opinion, this ride did not live up to its hype, but it was still incrediable. The dark ride portion of the ride was very nicely done, and I thought the treasure room scene was awesome aside from the non-moving mummys. But even that I was willing to let go for its surprisingly intense coaster portion of the ride. My only real compliant was that there is no real ending. For how spectacular this ride is bulit up to be and the massive lenghts of deatil that went into it you would think that there would be somewhat of a more substanial ending. I dont know if they ran out of room or money, maybe a combination of both. But its lack of an ending still does not take away from the jaw dropping effect the first time you ride. Ill be honest, I didnt expect much from this ride. There were mixed reviews and the hype died out almost immediatly after the ride opened. I figured that it was a letdown. However, I was at Universal Studios anyways, so why not give it a try? This ride was crazy. I can only describe it as a nice dark ride followed by Space Mountain on steroids. The dark ride section was fun, however I have one complaint about this part. The warrior mummys dont move! WTF? How am I supposed to be scared of warrior mummys that have NO movement? Anyone who has been on Dinosar at Animal Kingdom knows that you can make an intense ride experience using animatronics. If the warrior mummys had been making threatining motions, the dak ride section would have been a lot scarier. The Imhotept animatronics were very nicely done, and the scarab beetle scene was awsome. The coaster section was much more intense than I expected. The airtime was great. There were multiple points in the ride where you get CRAZY amounts of air. There are also tons of positive G turns. The special effects during the coaster section are wild and made the coaster even more intense. My one complaint about this section was the station "fake out". It wasnt very believable. I havent ridden too many rides that have their station in almost complete darkness with a ride op hidden behind a conveniantly mysterious screen. Nobody on any of my rides believed that the ride was really over. On a more positive note, the dive into the red smoke/mist/fog coming out of the station/fire scene was crazy. The red mist effect was one of the best parts of the ride. Dispite the lack of enthusiasm many people have for this ride, go to US to ride it, you wont regret it. A well done steel coaster.Revenge of the mummy gets a Big 10.The best effects you will ever find on a rollercoaster.The effect that amazed me the most was the celing fire.If your at Univerasl and it has a 2 hour wait either get a Universal Express or wait the 2 hours its well worth it.The thing I dont get is why would a Mummy type ride be in the New York section of the park.They have all those Studious buildings.O well its overall a great coaster and thrill ride you wont find any where else.